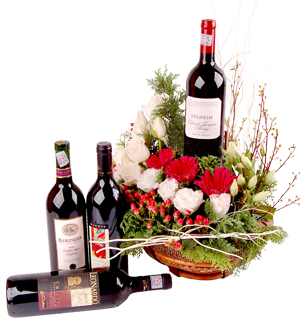 A stylish presentation of Roses, Gerberas and Berries in a willow basket and a bottle of fine wine(s). Wines stated are available within Klang Valley. The brand of wines are subject to availability at the time of ordering. Type of wines available differs in other States. Our Customer Service will advise accordingly should there be any changes. Call / Whatapps us at 03-78830233 / +6012-6915200 or sales@gift-lab.com for more information.